Detailing the physical features, habits, territorial reach and other identifying qualities of the False Bombardier Beetle. Though it looks like its explosive cousin, the False Bombardier Beetle lacks the same firepower that can kill its enemies. The False Bombardier Beetle is described more by what it cannot do than by what it can. True to its name, this beetle greatly resembles a family of beetles that can fire pulses of hot chemicals at perceived threats (including humans). It shares the same coloring, but it does not have that remarkable defensive mechanism. A black head and abdomen are separated by an orange thorax. Orange legs are long and strong. The elytra have linear ridges. Long antennae have thick orange segments coming off the head. Thanks to the reputation of its dangerous look-a-like, the False Bombardier Beetle may be less preyed upon. 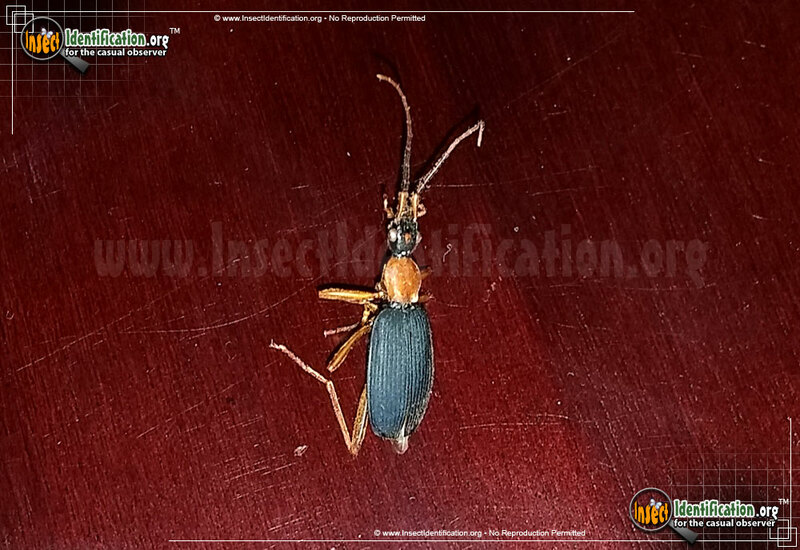 False Bombardier Beetles are a member of the Ground Beetle family, which is large and diverse. They can be found in woodlands, backyards, and moist areas. They meander along rocks, logs and leaf litter, and may be active at night as well as during the daytime.